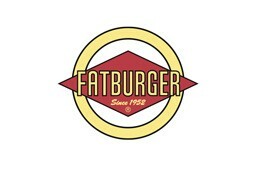 Fatburger is currently closed for delivery and it will open at . Tomatoes, bacon, cheddar-jack cheese, & tortilla strips. Garden salad with shredded cajun grilled chicken. Fresh ground beef layered with crisp beef bacon pieces, swiss & cheese, diced tomatoes & steak sauce in a flour tortilla. Hand breaded chicken tenders tossed in wing sauce, with shredded lettuce, tomatoes and bleu cheese dressing in a flour tortilla. Grilled chicken with romain lettuce, caesar dressing and parmesan cheese. Grilled chicken with chipotle ranch, pepper jack cheese, onion straws, lettuce and tomato.